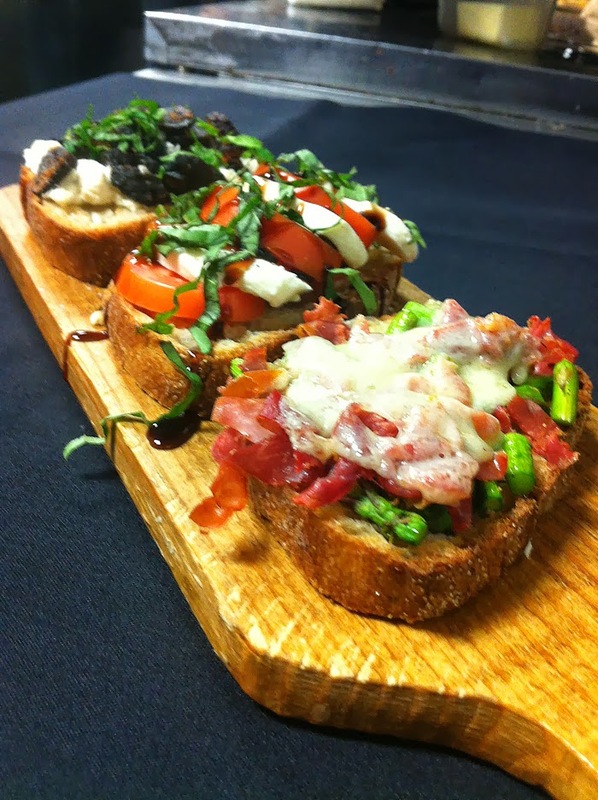 The menu at Armitage is conducive for sharing; offering things like olives, bruschettas, & cheese boards. There's also soups, a few salads and even some sandwiches. But what I think sets it apart from other area wine bars are the chef plates. More of an entree type dish these 5 plates seemed to me to stand out as being something different. Since I wasn't sure where to start with ordering I followed the suggestion of Matt, the owner, and got a bunch of different things to try. Matt is very passionate about his restaurant and the food and wine it puts forth. It was refreshing talking to him and hearing how the menu ingredients are purveyed from local sources year round. Which means that items are constantly changing-up to fit the season. While chatting with Matt my guests and I shared the baked brie, topped with agave nectar and stone fruit. 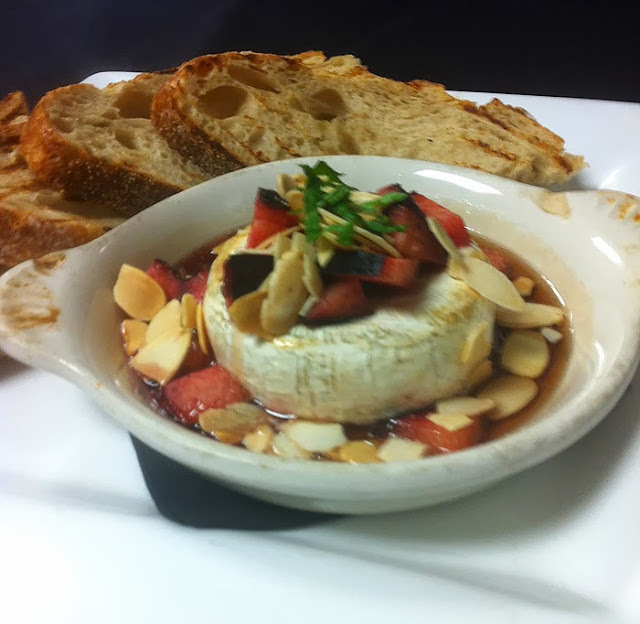 Brie is one of my favorites and the warm fruit compote really made this special. We followed that with a bruschetta board; a trio bruschettas cut in 3 pieces making it super easy to share. We choose the: spinach with artichoke & Asiago (spinach dip on bread), mozzarella, tomato & basil (simple classic) and the asparagus with Proscuitto & Havarti. From there we moved on to the sliders; mini burger buns topped with sliced prime rib and sauteed mushrooms. 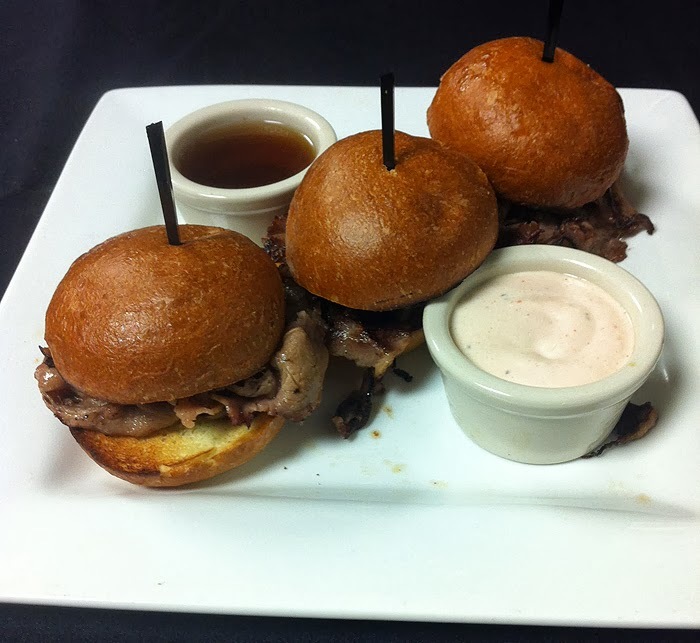 Served with a side of au jus and horseradish the sliders were fun to eat. 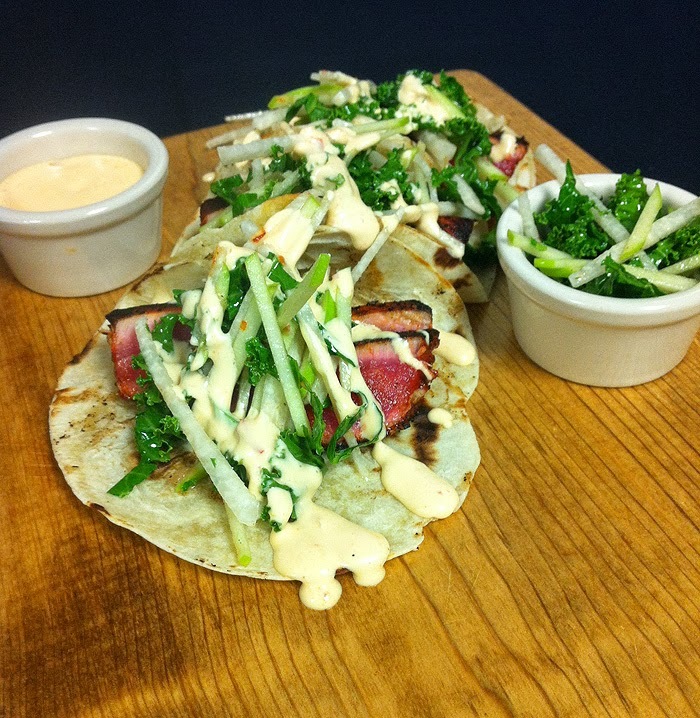 We could've easily stopped there and been content; but I'm really glad we didn't since the Blackened Ahi Tacos were definitely the winner amongst us that night. The plate included three tacos each with several nice size pieces of perfectly seared Ahi Tuna topped with a apple jicama slaw and drizzled with sirachi sauce. Though food is always front and center in my mind let's not forget that Armitage is a wine bar. They offer an extensive list of hand picked wines by both the bottle and the glass. If you are feeling a little intimidated about which wine to order, you can always enjoy one of their wine flights. Three different pours of a particular type of grape allows you to taste wines you are unfamiliar with before committing to a glass or bottle. I love the idea behind wine flights; I think it helps take the pressure off ordering. Armitage also offers happy hour seven days a week with food and drink specials from 4pm-7pm and from what I hear an amazing Sunday brunch with live music from 10am-2pm. Between the atmosphere, food and wine selection Armitage provides the perfect backdrop for just about any affair. So grab a friend or maybe a few and make your way to Armitage for your next night out or event. I needs to come to Scottsdale! The food looks incredible!!! !